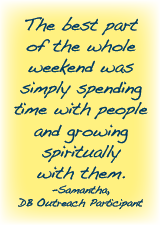 In the beginning, it was all about skiing for Samantha. 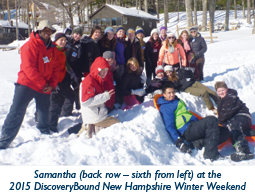 She had never participated in a DiscoveryBound Outreach activity and was apprehensive about the 2015 New Hampshire Winter Weekend. The foundation of love and support established during the drive gave Samantha the tools she needed to address a nagging concern: a feeling that she needed to impress others with her competency as a skier. DiscoveryBound Outreach is a community outreach program that provides local family activities, regional retreats and national teen conferences for Christian Scientists and their friends.